I admit, it was the video of “Caroline” that drew me to The Long-Awaited Album by Steve Martin and the Steep Canyon Rangers. It has that Martin-esque blend of specifically unique humor and woebegone-rejected boyfriend in a presentation of musical exceptionalism. The melody is hummable without being predictable and of course the instrumentation is bluegrass and folk – not overproduced digital muck. 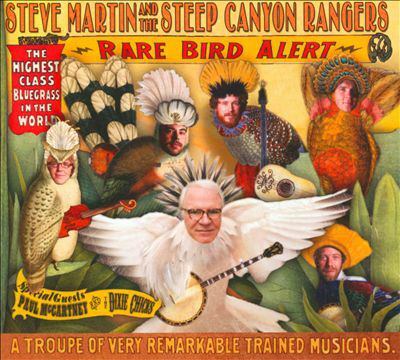 The Long-Awaited Album is performed by Steve Martin (banjo, vocals) and the Steep Canyon Rangers (Woody Platt, Mike Guggino, Nicky Sanders, Mike Ashworth, Graham Sharp, Charles Humphrey III). Produced by Peter Asher. Contents: Santa Fe (3:12) — Caroline (3:22) — All night long (3:44) — Canadian girl (3:10) — Office supplies (2:00) — Bad night (4:04) — Strangest Christmas yet (3:40) — Always will (1:27) — So familiar (2:59) — Nights in the lab (2:46) — Angeline the barista (1:46) — On the water (2:35) — Girl from river run (3:21) — Promontory point (1:07). Be sure, The Long-Awaited Album is serious music and not solely a vehicle for our beloved ‘wild and crazy guy.’ Martin has gone from comedian to actor and now to musician with the bona fides to show for it. Martin has won Grammy Awards for Best Bluegrass album The Crow New Songs for the Five-String Banjo, Best Americana album, Love Has Come for You with Edie Brikell, and received Grammy nominations for Best Bluegrass album Rare Bird Alert. In addition, he and Brikell earned a Grammy and a Tony nomination for the musical, Bright Star and won the Drama Desk Award for Outstanding Music. And it’s not just Hollywood and NYC that recognize Martin’s mad banjo skills: he was the 2011 International Bluegrass Music Association’s Entertainer of the Year. “Steve Martin and crew carry on the rich legacy of bluegrass pioneers like Lester Flatt, Earl Scruggs, and Bill Monroe. With no lack of musicianship, the band could take this genre in any direction they like, yet remain adeptly in tune with the intentions and expectations of the bluegrass style. From furious flatpicking to glistening mandolin licks, The Long-Awaited Album heralds every instrumental archetype that a purist could hope for. Bluegrass is a vehicle for instrumentalists with extraordinary skill as well as an outlet for experimentation with form and lyrics. You won’t be disappointed even if you’re not already a fan. The Crow New Songs for the Five-String Banjo is a banjo album, spotlighting Martin originals on the instrument (of the 16 tracks, all but one are his own compositions). This is no vanity project. Tracks like the stirring and revealing “Daddy Played the Banjo,” the blisteringly kinetic “Hoedown at Alice’s,” and the expansive, even beautifully ornate “Calico Train” not only wouldn’t seem out of place on any progressive bluegrass album, they’d probably be the best cuts on it. Martin has a lot of help, yes, from the likes of Mary Black, Vince Gill, Tim O’Brien, Dolly Parton, Earl Scruggs, Tony Trischka, and Pete Wernick, and the album is lovingly produced by John McEuen of the Nitty Gritty Dirt Band, but make no mistake, this is completely Martin’s album and it’s his vision all the way. Everyone knows that Martin can be very funny, but The Crow isn’t a joke. It’s a first-class banjo album. ~ Steve L.eggett.